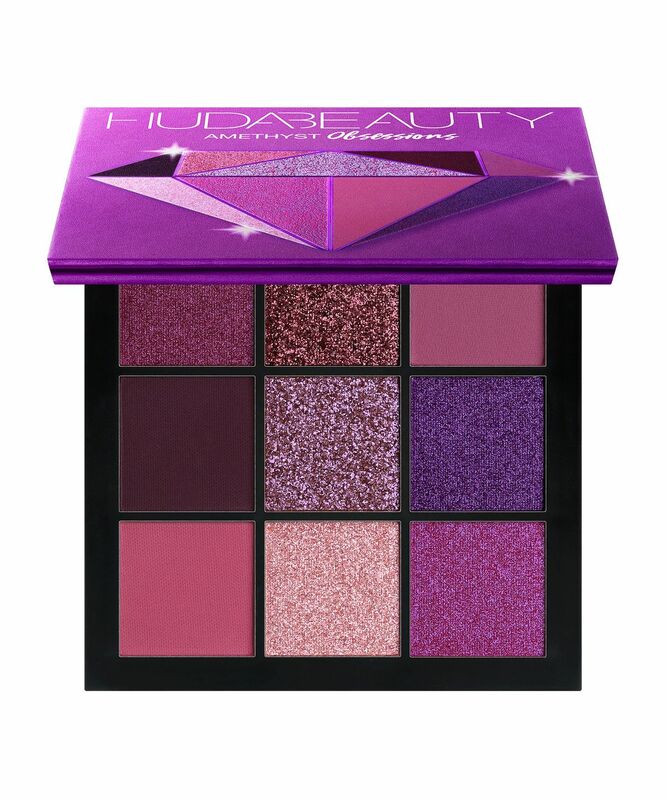 Definitive proof that the best things do (sometimes) come in smaller packages, Huda Beauty’s Precious Stones Obsessions Palettes are here – and they’re absolutely exquisite! 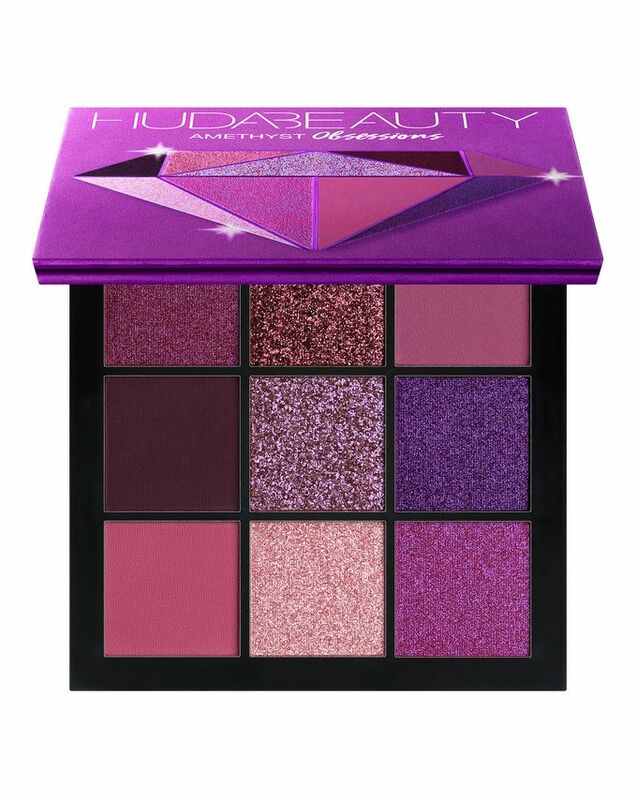 A dream come true for those Huda-holics who can’t squeeze their palettes into overstretched make up bags (or those yet to sample her game-changing shadows) this Amethyst Obsessions Palette unites a spectrum of nine pigment-packed powders – six vibrant duo-chrome shimmers and three creamy mattes – in shades ranging from moody mauve and violet to barely there pink. The colours are beautiful and easy to blend. It is a beautiful selection of purples and it is just gorgeous. Would definitely recommend. It is just smaller than I expected but I got it on discount so that's not a problem for me. Having a mini cute gorgeous palette to carry around. It is the perfect size. These eyeshadows are definitely worth the money. They are a bit more than normal eyeshadow but the formula is so smooth and incredibly easy to blend. Also they are PIGMENTED so you don’t have to use half the eyeshadow up to get the colour that you want, you only have to tap your brush. Lovely little stocking filler for my daughter. She loves them! Just like her other Huda Beauty products, they are so easy to apply and they look amazing! Fan-freakin-tastic! Love the colours and the feeling when applying. I am absolutely disgusted at the price of these. I got 3 for my daughter so paid £75. They are tiny! I can't believe how small they are. Definitely not value for money when you see the size of other brands palettes and the price. I will never buy these again. The pallet is pretty however the matt shades tend to run ashy if you have dark skin and honestly I do believe the pallet is worth around £15 and not £25 for the amount you get. That being said the shimmer colours are beautiful and pigmented. This a great little collection of pinks! Perhaps one of the most versatile of the Precious Stones line, along with the Topaz, as it can fit all occasions. The mattes are perhaps slightly less buttery than the usual Huda formula, but they do the job. The bordeaux shade is a little harder to blend, though still beautiful and ties all the rest of the colours in wonderfully. The foils and shimmers are incredible. You will need a wet brush or finger to make them work for your money. The light pink and lilac are what dreams are made of. I've just received this palette from Cult Beauty, very fast delivery! As for the palette the colours are stunning, right up my alley. I have had high hopes for this mini wonder, however, the quality of the shadows are a lot to be desired. The shimmers are fine but the mattes are patchy, like very patchy. I was disappointed, to be honest, and surprised that my Colorpop shadows are so much better than Huda Beauty. I guess I'll stick to TooFaced and Colorpop. I bought it because of the centre and bottom-right shadows, and I was not disappointed, they make my eyes look very green. I use my fingers and a wet brush to apply the glitters. I love purple, it's the color of my soul and I've been searching for a good purple toned palette which has both mattes and shimmers for a while. I've found it in this. Now I've seen reviews and the swatches looked pretty bad, yet I decided to give it a shot. It was a good decision. It swatches bad but applies with the right brushes (I've used a mix of Zoeva / Real Techniques ) and a primer the color payoff is really good. You may need to work a bit with one or two of the matte shades as they will take some precision to blend but overall I've had very good results with this palette. I don't know if it's part of the permanent collection but I sure hope she makes it, I'm loving this. I love this palette so much, I though with purple shades it may be patchy, but it isn’t at all. The shimmers are so amazing and the pigment is great. This palette is the best. I love this palette. I love all the Huda Beauty Palette's but this colour is my favourite, absolutely gorgeous. Not very pigmented at all, quite chalky and I have to repeatedly use the colour to get it to be vibrant. I'm not very pleased with the product and it's not worth the money either if I’m completely honest. This is a let down, I was looking forward to trying this from the things I’ve heard and read about the other Huda beauty makeup. Love that the packaging is very travel friendly and has a mirror! Those metallics are to die for. When I first swatched the mattes they looked really patchy on my hand, but once I got a brush in there and started blending on the eyelid it looked amazing I wore the shadow for 10 hours with no primer and it still looked amazing by the end of the day. Really impressed with this! Beautiful palette and nice formulas of the shimmers and duochromes! Very unique palette. Amazing shades, the matte ones and the metallic ones are perfect. It's not the best quality, but it's good.